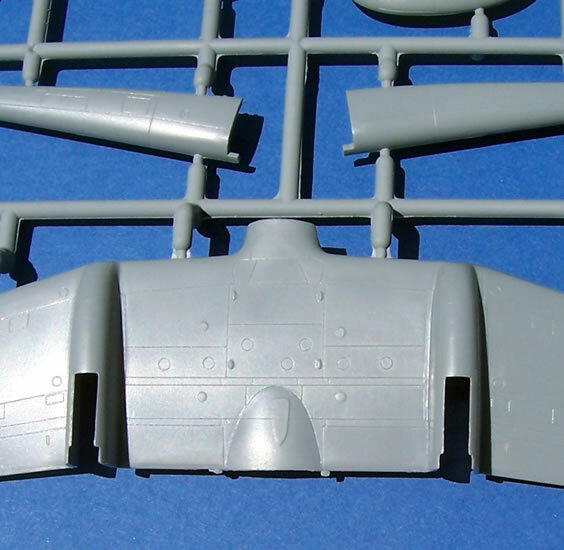 Photo-Etch (PE) cockpit, undercarriage & airframe surface detail sets for the Special Hobby SAAB J21A & J21R kits. 1 x pre-coloured & 1 x plain PE fret with detailed instructions. High quality components, the pre-coloured PE provides a cockpit finish better than most modellers can achieve by other means in this scale. The surface detail panels seem unnecessary, and if added as intended will make the model less realistic by giving it a “boiler-plate” look. Two very good quality sets that will enhance their intended kits, just don’t bother with the airframe panels - Recommended. 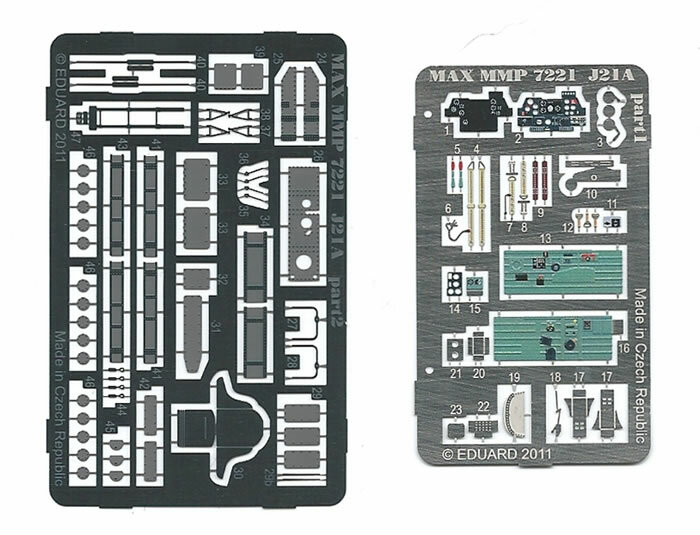 The Maestro Models sets reviewed here are produced by Eduard, so it should come as no surprise that the parts are very good quality. The sets come in a resealable cellophane envelope with card backing and detailed instructions filling both sides of an A-4 sized sheet of paper. 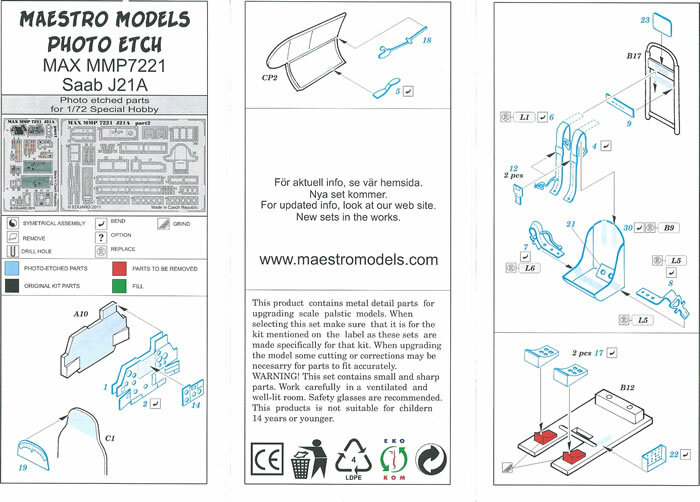 The instructions are very clearly printed, and the diagram outlines are colour-coded to distinguish between kit parts, PE, or parts to be removed or filled. Both sets are similar, straightforward and quite comprehensive. They will serve to really lift the appearance of the cockpits as in this scale I think that pre-coloured PE works really well. It achieves a level of detail and finish to seat belts and instrument panels in particular that is probably superior to what most modellers could achieve by other means. Also improved are the inside surfaces of the undercarriage doors and also the undercarriage legs with brake-lines and torque-links. 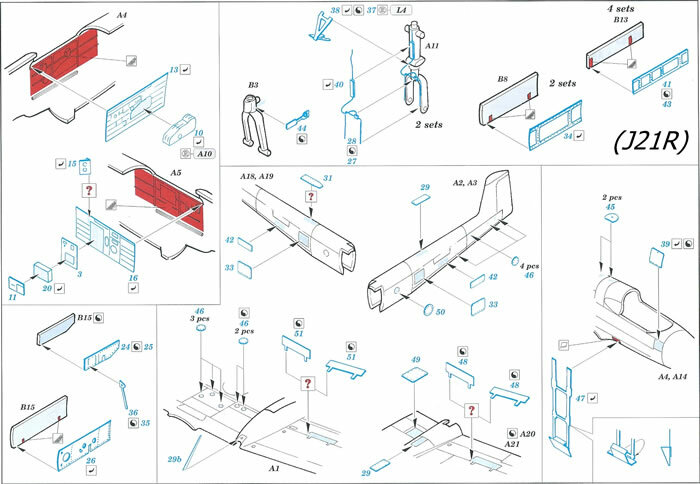 Another most welcome feature is the retractable boarding ladder, quite a distinguishing feature of the SAAB 21. There are large numbers of small panels intended to improve the surface detail. 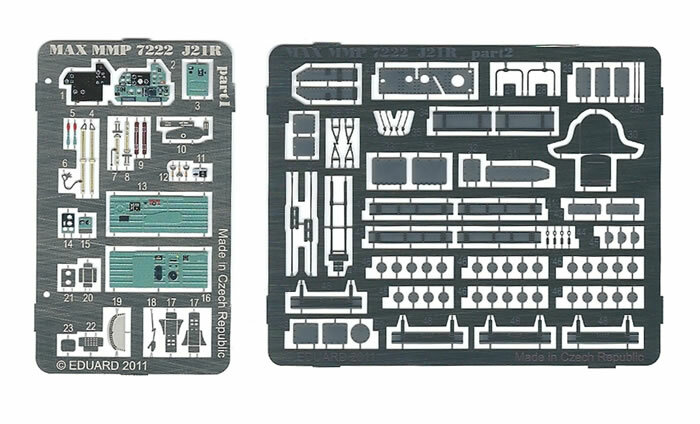 Generally these PE panels are already represented on the kit (see the accompanying image of the kit sprue) although unlike the PE the kit does not have the screw or rivet heads indicated. 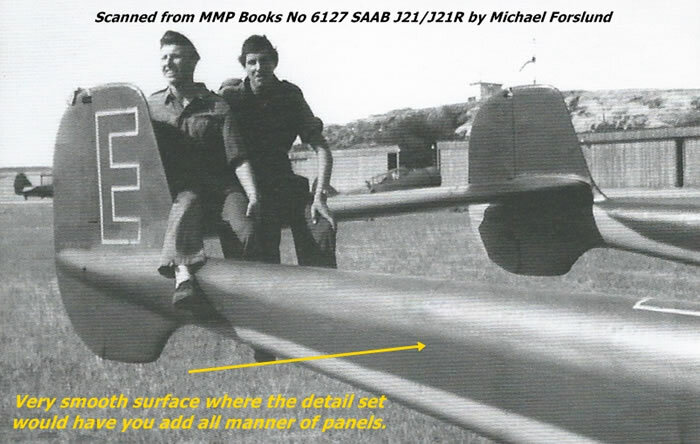 Having studied many J21 images, including those in the excellent Mushroom Publications book on this aircraft, I can state with confidence that the SAAB J21 had a very smooth airframe finish. I would be concerned the PE additions may appear too raised above the surface, and could risk making the model look like it has been made from boiler-plate. If they are to be used I feel that a method of blending these in will needed: The kit parts could be rebated to receive the PE (tricky), or the PE blended in with Mr. Surfacer (easier but probably less effective), or possibly the PE could be sanded down to a thinner section (risk-prone). However it seems to me that either leaving the kit’s parts as they are, or just indenting your own screw heads instead, is probably the best solution and most in keeping with the kit’s surface detail. 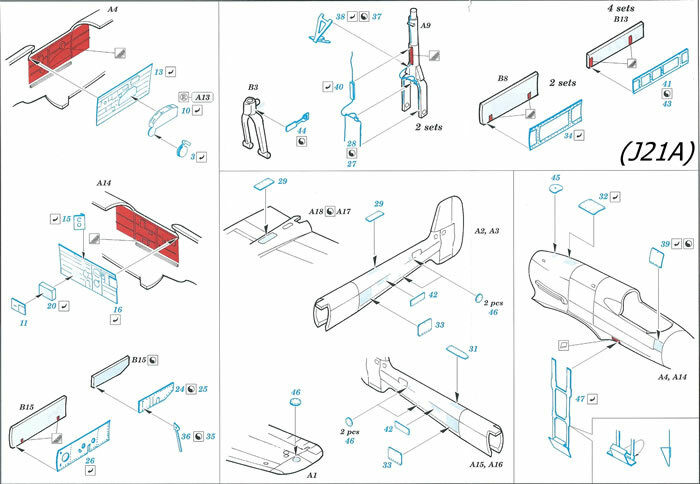 These are very good quality and quite comprehensive detail sets for the fairly recent Special Hobby SAAB 21A & R kits. They will provide a considerable lift to these kits (and possibly would suit the Heller J21A too). I think that just affixing the PE removable airframe panels could risk making the model look like it has been made from boiler-plate. Either ignoring the PE parts or scribing this missing screw-head detail may be better options. 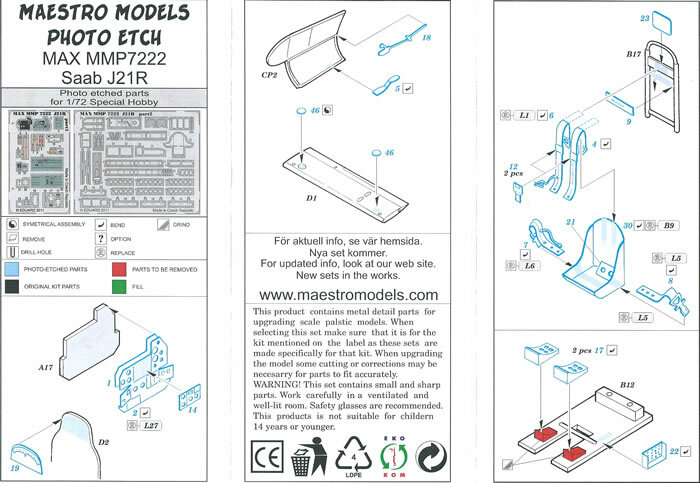 I’m happy to recommend these sets and encourage readers to check out Maestro models’ range. Thanks to Maestro Models for the review sample..